The upcoming smartphones from the Oppo family named the R15 and R15 Plus teased an image and a video that confirms the notch display design. 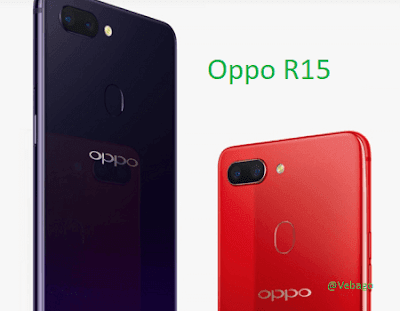 Today the Oppo R15 has listed on the oppo's Chinese official site which comes in Red, White, Blue, and Mirror Red colors. The OPPO R15 runs on Android 8.1 (Oreo) with ColorOS 5.0. The device comes with a 6.28-inch (2280 × 1080 pixels) Full HD+ 19:9 AMOLED display and is powered by an Octa Core Snapdragon 660 processor with Adreno 512 GPU. The smartphone packs a 6GB of RAM and 128GB of internal storage memory which can be expandable memory up to 256GB with a microSD. The Hybrid Dual SIM (nano + nano/microSD) smartphone measures 155.1 × 75.2 × 7.4mm and Weights 175g. There is a 16MP rear camera with a dual-tone LED Flash and a 5MP secondary camera. On the front, it comes with a 20MP front-facing camera and has a Fingerprint sensor. The OPPO R15 smartphone is powered by a 3365mAh battery with VOOC Flash Charging. Connectivity options on the OPPO R15 smartphone include 4G VoLTE, Bluetooth v5, WiFi 802.11 ac, GPS + GLONASS and a USB Type-C.